With my reading preferences continuing to lean towards the epic fantasy and science fiction genres, I'm excited to participate in The 2013 Sci-Fi Experience, brought once again to you by Carl at Stainless Steel Droppings. Over the past year I made a considerable number of changes, including not accepting the majority of review requests, and instead only reviewed the books I picked out for myself. The result was a much happier year in reading, without pressures. I'll definitely continue this ban on review requests simply because the blog has now become my "happy place" and I post only when I've reviewed a book that I've read, and not because I have a deadline to meet. This blog is a place I rest at when the work day is long. Which means that when Carl has a reading event planned, it's never a challenge, just a chance to continue to do something different. I'm ready for the experience again and while I haven't picked specific books yet, I'm thinking Jules Verne, Edgar Rice Burroughs (I just watched the movie John Carter and had no idea that story came from a book written about a hundred years ago), Douglas Adams, and definitely more of Hugh Howey. I also have a couple of George R.R. Martin sci-fi books that are signed by the author that I received sometime last year and have been meaning to get to. Here's to a new year, my friends. Will you be trying something different in your reading preferences this year? Let me know if you plan to go outside of your comfort zone, your go-to selection of books, and try something "out there." 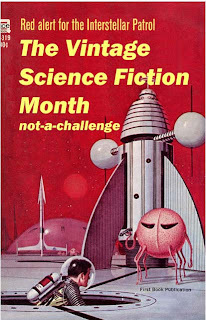 [Edited 8:38 am EST] I also noticed that there is a vintage sci-fi experience as well, so I'm definitely joining the Little Red Reviewer for her month of January with vintage sci-fi tales. And, in this case also, this is not-a-challenge. This is just for fun. I'm looking forward to it. Why not join along and try something new? I love a good sci-fi novel every now and then. There is something about being transfixed by something completely different, one that requires you to stretch your brain a bit. I like your idea of not accepting the majority of review requests. I was really working on decreasing the number I accepted in 2012. I was successful but have such a tremendous backlog that I'm working through those now. Thankfully, I am almost finished and hope that I can definitely stay relatively review-copy-free for the rest of the year. I agree that it will make for a much happier reading experience to read what I actually own and not feel pressured to meet a deadline! Thrilled to have you along for all this SciFi fun stuff. Carl's SciFi experience is completely chilled out and everyone has a ball. I tend to stress out over my own Vintage stuff, but all I'm interested in is people having fun, and learning about more old school authors that I wasn't familiar with before. I too have drastically cut down on the review requests I accept. For the most part i read dead-trees, and that means publishers have to pay for shipping. So I only say "yes, please!" if it's something i really really want. doesn't help that my bookshelves are bursting with midlist stuff that I'd rather be reading. 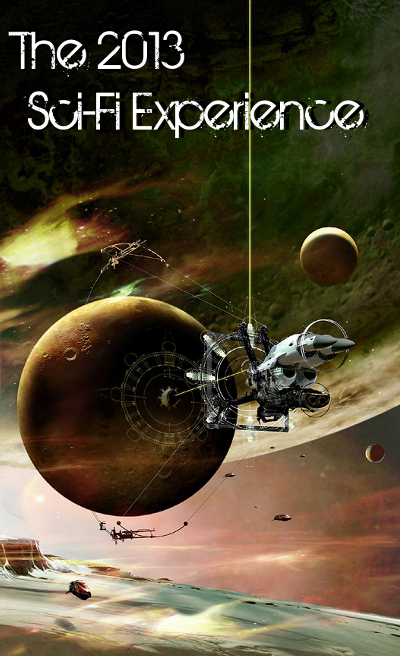 SciFi is a favorite genre of mine even though I didn't read that much of it last year. 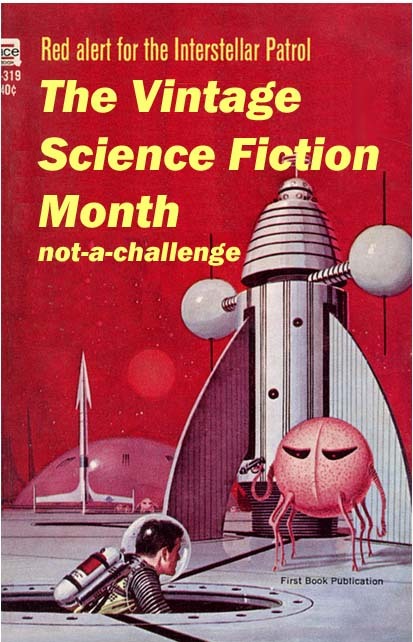 I'm definitely participating in the SciFi Experience again this year and I've got a couple of vintage books that I hope to read in January. You will have a good, relaxing time with both "non challenges". The only down side to them is my TBR list grows but I refuse to think of that as a problem. I look forward to reading your reviews. I'm so happy that you are joining in, and it makes me smile to read about your accepting this blog as your "happy place". Blogging should be a pleasure and it is something we all have to remind ourselves of on occasion when it gets stressful or we feel pressured to perform. I don't accept many review offers for that same reason. Doesn't stop reviewers from sending me books but it does stop me from feeling stressed if I don't choose to read the books I've been sent. I hope this is an even happier place for you in the coming year. Hooray, another person with Burroughs plans! I've already read my first Burroughs book for this challenge, with at least one more planned. If you pick up A Princess of Mars, I'll be curious to see what you think!